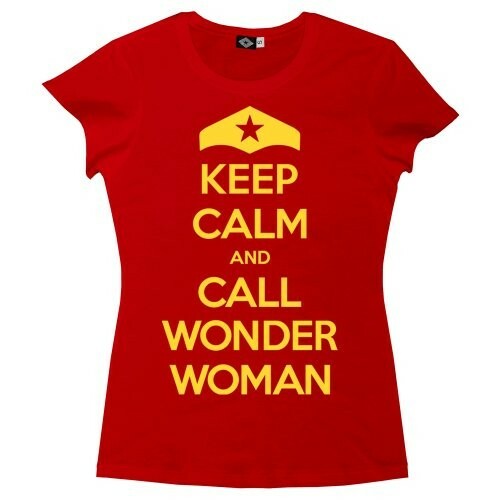 When there's trouble, just keep calm and call Wonder Woman. This super soft, short sleeved, crew neck t-shirt is 100% supima cotton jersey. Garment washed for softness, this tee is pre-shrunk for a true fit. Available in adult sizes extra-small (US size 0 - 2) to extra-large (adult size 16 - 18). Please note: this shirt is a fitted style; consider ordering a size up if you prefer a looser fit. You can also find this shirt in toddler and child sizes. For more girl-empowering 'Keep Calm' shirts, check out the Keep Calm and Call Batgirl and Keep Calm and Carry a Wand versions. For all of our superhero-themed clothing for all ages, visit our Superhero Clothing section. To check out many more superhero-related t-shirts, toys, books and other items, visit A Mighty Girl's Superhero Collection.